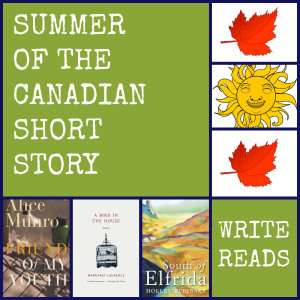 This is my third short story collection for Summer of the Canadian Short Story, hosted by Tania @ Write Reads. My first two were Astray by Emma Donoghue and Moral Disorder by Margaret Atwood. 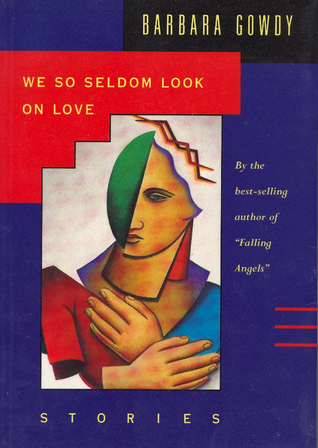 We So Seldom Look On Love was actually recommended to me by Tania, but at first I didn’t think it was in the cards because my library didn’t have it. Then, one day not long ago, I was in a used book store and there it was. Like fate! I was in between books, so I started it right away, thinking it would be my second book, but I ended up just reading it right through. The stories are so strange and fascinating that I was too curious to see what was next to start a different book. Then, I was disappointed when it ended. So, thanks for the suggestion, Tania! 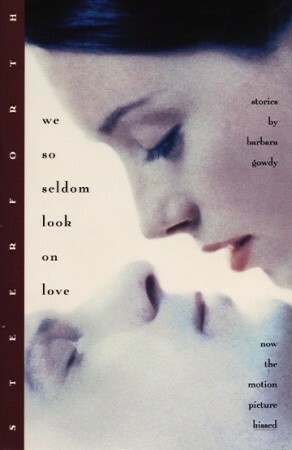 I have read two other books by Barbara Gowdy. I loved The White Bone. The Romantic was good, too, but it made me sad. There is a difference between books that are sad and books that make me sad, but I can’t put my finger on it. There are eight stories in this collection, and, like I said, most of them are unusual. As the back of the book says, “… Barbara Gowdy investigates life at its extremes, pushing past limits of convention into lives that are fantastic and heartbreakingly real”. 1. Body and Soul eases you in. It is not too strange, although still an unusual situation for most people. It is about an older lady who takes in foster children out of the goodness of her heart. In fact, she can’t seem to say ‘no’, even when she knows the child might be beyond her capabilities as a caretaker. 2. Sylvie takes us straight into bizarre and unpredictable. Sylvie is born with another set of legs growing out of her belly. They are named Sue and are smaller than ordinary legs, so they just hang there under Sylvie’s clothes. Once she’s grown, she joins a carnival where she meets Merry May the Fat Lady and spends some happy years. At one point Merry May has a baby who she names Sue, after Sylvie’s legs. The minute she’d laid eyes on Sue it had struck her that it was all right being deformed if deformity had to exist for there to be such perfection. Eventually, Sylvie leaves the carnival to be with a man who falls in love with her. He arranges an operation for her, but I won’t tell you how it turns out. I think the end of this one was partly up for interpretation. If you have read it, any suggestions for the meaning of this one? 3. In Presbyterian Crosswalk, 11-year-old Beth discovers that she can float. Because of this, and because her grandmother talks to her about prayer, Beth has faith that if you want something to happen, you just have to want it badly enough and ask for it enough. When she persuades a friend to try this out, things don’t end up exactly the way Beth was hoping for. This story investigates the idea of faith, and what it means to different people. For Beth, is the ending tragic, or does it make some sort of strange sense? 4. Ninety-Three Million Miles Away is probably the most sexually explicit of the stories. Ali and Claude are happily married, but Ali finds herself at loose ends. When she notices the man in the neighbouring apartment building watching her through the windows, Ali becomes interested, then obsessed with keeping him coming back for more. She realizes she will always have the feeling that nothing will ever be enough; that she will never be satisfied with what she has. The world was too full of surprises, it frightened her. As Claude was always saying, things looked different from different angles and in different lights. What this meant to her is that everything hinged on where you happened to be standing at a given moment, or even on who you imagined you were. It meant that in certain lights, desire sprang up out of nowhere. 5. The Two-Headed Man is strange. (Google at your own risk.) In this story, the man’s name is Samuel, and Simon is the extra head. But he can think and talk and cause Samuel a lot of problems. What would you do if you had an extra head that drove you mad? Is it ethical to have a second head removed? Or is it murder? Once again, I need the ending of this one explained to me. Anyone? 6. I thought that Lizards was more tragic than anything else. Emma and Gerry seem to be happy together, but Emma can’t seem to be able to stop herself from cheating on Gerry. The tragic part of the story happens long after the cheating, and only indirectly because of it. Really, it’s too sad to say anything more. … the way to cope with the biggest shock of your life is to replay it until it becomes commonplace. There are a million truths. She understands that she has no idea which one matters. 7. 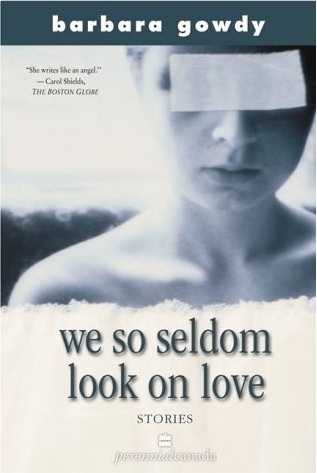 We So Seldom Look On Love was definitely the most disturbing story for me. We meet the protagonist at the age of 13, when she is just starting to become fascinated with dead bodies. Except, at this age, they are only of animals. At the age of 16, she knows that what she really wants are human corpses, male human corpses. The story goes into great detail about what she wants from them and how she gets it. Also, how it effects her boyfriend over time. Let’s leave it at that. I had discovered myself to be irredeemably abnormal. I could either slit my throat or surrender – wholeheartedly now – to my obsession. I surrendered. … I think that all desire is desire for transformation, and that all transformation – all movement, all process – happens because life turns into death. 8. Flesh of My Flesh might have been my favourite story in the collection. It was longer, had more depth, and included some soul-searching for the protagonist. On their wedding night, Marion finds out that she is married to a transsexual. There is one major procedure that Sam has not yet undergone. As Marion decides what to do, her thoughts take us back to events in her life leading up to this point; her mother’s murder, her first husband and their divorce. You can’t help but want things to work out for her. Presenting myself as a guy might seem like a lie to you. But to me I am a guy. Marion is taking it second by second. Will she tell Sam not to come up to the apartment? A second later it’s, Will she let him unpack? While she’s wondering he goes ahead. In the interval between one second and the next, he moves in. So, there you have it. Possibly one of the strangest collections of stories I have ever read. But, highly entertaining, and full of compassion for its characters. If you read that whole thing, I am impressed. So, how about you? What are some of the strangest books you have read? After we talked about it yesterday, I think I need to re-read this collection. You have such a wonderful way with words. I really liked your comment: “There is a difference between books that are sad and books that make me sad, but I can’t put my finger on it.” I feel this is something I haven’t ever been able to express myself. I’m with you. I don’t read many strange stories or books. I think that’s why I had so much fun with this one. Some of the stories in Stone Mattress might qualify as well. Maybe short stories are the way to go if you’re looking for strange or different. They do all sound very strange! I think short story collections often have a tendency to be that way, and I’m not sure why. I also really liked what you said about the difference between sad stories vs. stories that make you sad. I feel exactly the same way, but I can never explain the difference! I guess it’s not just me! We probably all have our own criteria, though. We just don’t always know what it is. This is a great review! It is a super strange collection of stories, but it kept me completely enthralled when I read it. I think there is a difference between sad books and books that make you sad…we’ll have to explore this more. Great book suggestion, Tania! I’m glad I found it! I googled, because I had to know if it was actually possible (I had never thought of such things before), and there they were! A lot of people are commenting on my sad books comment, so, I agree, I think we should explore this somehow. But, how? ‘Compassion’ is the word I always return to when talking about her writing: she amazes me, the way she employs it so deftly, pulls us into dark corners and makes us feel every iota of that darkness. It’s been nearly ten years since I read this collection, but I still remember stumbling into the fourth story on public transit and wondering if the people standing/sitting near me could see over my shoulder what an explicit little number it is! (The title story was made into a film, but I can’t think of the name: ‘Kissed’, perhaps?) Really enjoyed reading your thoughts on these…I’d like to reread now! This was such a fun book to read for me! And, you’re right, no matter how strange the story or the character, you can’t help but feel for them and wish them well. Except for that second head. He was a miserable ‘guy’. I’m quite sure I wouldn’t want to see that film – the story was disturbing enough. But, I wonder if they were able to get it right. Oh, now I’m curious!